And we’re here to party. Happy 19th anniversary, Simmers! It’s almost hard to believe how far The Sims™ has come, and we really want to say thanks. So much of what we do each day is inspired by your dedication, creativity, and interaction with other members of our community. It seems like only yesterday (sniffle) we embarked on this journey together (sniffle), and look at us now. We’ve laughed, we’ve cried, we’ve dressed our Sims in bear costumes, we’ve summoned the Grim Reaper more times than we’d like to admit, and we’ve had our fair share of ghost encounters. As a thank you, check out this special Threadless t-shirt design and be sure to hit up the Anniversary Sale*, on now! Plus, watch today's livestream for some community fun. So, what else shall you do to celebrate? 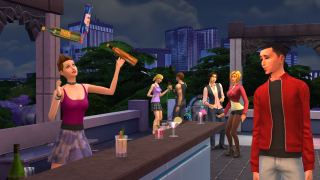 Well, how about throwing a massive party in The Sims 4** with all your Sim’s friends and frenemies? Grab a bottle of nectar – and possibly a cow plant – and let’s plan a superior shindig. Look, we know you've got some neighborhood Sims in mind for your blowout bash, but how about some star power? Before you start party planning, consider checking out the Gallery. Your fellow Simmers have created some incredible celebrity look-a-likes and new, original characters that are ready to party, too. Get in there and add any must-invite Sims for your guest list. Ok, now click the phone icon and select Plan a Social Event. The hosting Sim will need lots of connections to have a bevy of guests, so choose a popular one. Think about the guest list, hire a caterer, and even get a DJ! Or, for a smaller get-together, just do as your budget allows. You can throw a party with Goals or just have people over to hang out. Remember: your party, your terms. We do highly recommend a pool for full fiesta fun. Select Plan Outfit from your Sim’s dresser and set your Sim’s Party Outfit with something fierce. Sparkly, shiny, casual, comfortable – the choice is yours. If you want to make sure all of your attendees are dressed to the nines, you can pop into other Sims’ homes and fix their outfits, too. Dress codes are the best codes, amirite? You can have all the best outfits and food, but a party will fall flat if the attendees are tense, rude, or all-around boring. If you’re into the arts, be sure to recruit painters and snobs from the neighborhood. If you’re looking for a raucous occasion, befriend hotheads and social butterflies. Whatever floats your boat, float it with interesting Sims. Are you not entertained?! Food, drinks, and good company go a long way, but when the conversation lulls, guests could use a little something extra. Learn a party trick like playing the piano, or have some sweet dance moves to show off. On second thought, that may hinder your wardrobe choices. Well, whatever you do, make it good. Your party couldn’t possibly be complete without a little razzle-dazzle. *Conditions & restrictions apply. See www.origin.com/store/deals/simssale for details. **Requires The Sims 4 game (sold separately) and all game updates to play.